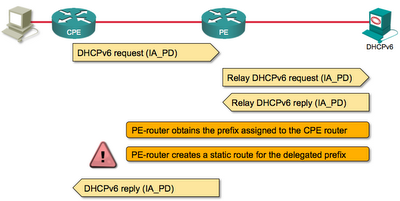 CPE sends DHCPv6 request message with IA-PD option to the PE-router. PE-router relays the message to the DHCPv6 server. 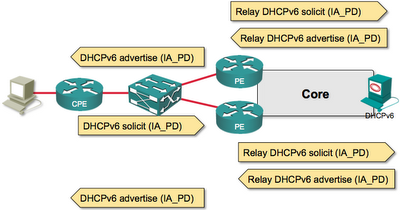 DHCPv6 server allocates a prefix to the CPE router and returns the prefix in the DHCPv6 reply message. CPE starts using the delegated prefix to address its interfaces. Now imagine you have a switched layer-2 access network and two PE-routers connected to it for redundancy purposes. This is not a good idea – the first-hop switch in the service provider network should be a layer-3 device for security reasons. The CPE router still sends a single solicit message, but each PE-router relays that to the DHCPv6 server. DHCPv6 server will send back two advertise messages, both will get relayed to the CPE router (each PE-router will relay the response to its relayed solicit message), and the CPE router will pick one or the other. 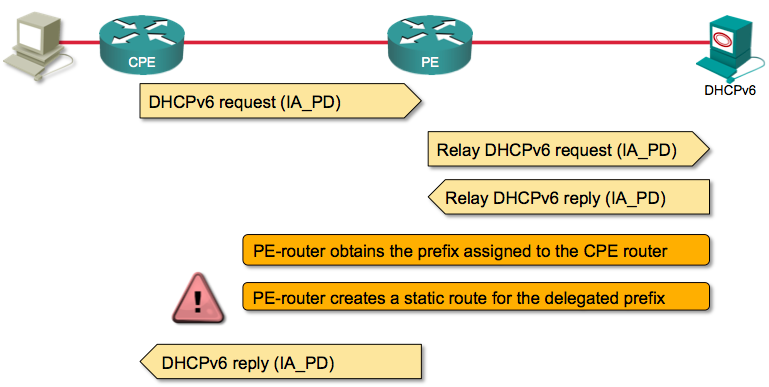 The CPE router subsequently sends a DHCPv6 request message to the selected PE-router (acting as a relay), eventually gets back the delegated prefix, and the PE-router has a static route … but the other PE-router is not aware of what’s going on. One of the problems is obvious – you might get suboptimal routing, because one of the PE-routers lacks routes toward destination(s) with next hop in directly connected access network … but we can solve that with routing protocols that support third-party next hops. However, matters get much worse if one of the PE-routers crashes. The static routes are lost (they can be regained with BULK LEASE mechanism once the PE-router completes the reload), but in the meantime the CPE devices served by that PE-router have no connectivity, even though you have a totally redundant access network. Is this scenario relevant? Do you use something like that in your access network? Would you be impacted? Write a comment – Tomasz needs real-life use cases. Building Large IPv6 Service Provider Networks webinar describes access- and core-layer technologies and designs. in the title you suggest a solution, but it might not be the only one. Markus and I wrote a draft on state maintenance for PD a while back. my favourite approach would be a simple BFD echo mechanism done by the CPE. After giving it more thought, there's a bit of a problem with this problem. There's part of the description that is wrong: "The CPE router subsequently sends a DHCPv6 request message to the selected PE-router (acting as a relay), eventually gets back the delegated prefix, and the PE-router has a static route … but the other PE-router is not aware of what’s going on.". What actually happens is: CPE chooses one response, but that is still usually multicast message (with a DUID that represents chosen server). Both relays (both PE routers) gets it and both forward them to a server. Server will get two copies of the same message and will generate two answers. All reasonable servers will generate the same answer twice, but each answer will be relayed back via appropriate relay (the one that transmitted this particular copy of the message). So it turns out that both relays will get the information. You may possible get into described problems (sort of) if you use unicast option that allows CPEs to contact server directly, bypassing relays. However, my understanding is that no sane network operator would do that and expect his relays to operate properly. I still think that the original solution I proposed will work. Each relay knows relay-ids of itself and the other relay. If it crashes, it can use bulk leasequery to retrieve lost routes, using query by relay-id. 1. It is bulk leasequery mechanism, not bulk lease.